TERROR FROM BEYOND THE DAVES is pleased to welcome Sean Kotz as a guest blogger! Sean is co-founder of Horse Archer Productions. 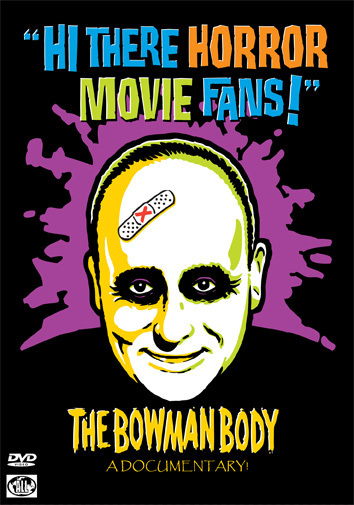 He and his partner, Chris Valluzzo, produced, directed and released their second horror host documentary in 2011 called HI THERE HORROR MOVIE FANS about legendary host, The Bowman Body. The film has been nominated for Rondo Award for Best Documentary of 2011. 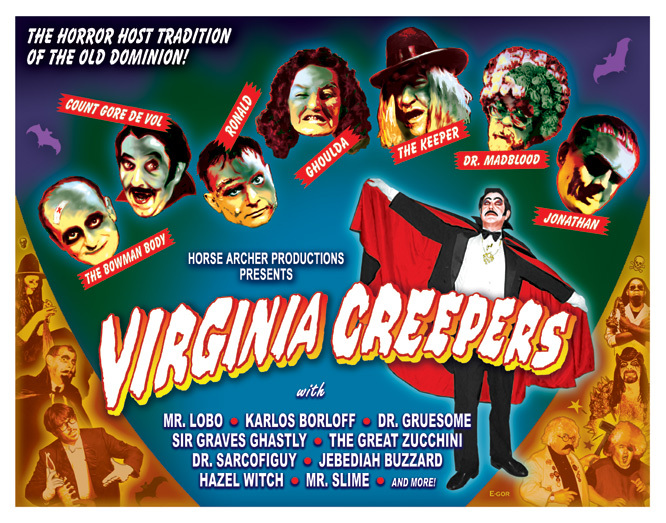 Back in 2008, I had an idea for a documentary about Virginia‘s rich horror host tradition which eventually became the 2009 release, VIRGINIA CREEPERS: THE HORROR HOST TRADITION OF THE OLD DOMINION and covered the D.C. airwaves as well. Happily, the film was well received but to our surprise, we immediately got requests for more on central Virginia area host, the Bowman Body. The Bowman Body section was the longest contiguous part of the film already, but despite that, there was plenty more to be said. In the first cut (which admittedly would make Peter Jackson look like a haiku master), there was 40 minutes on Bill, so I knew we had enough for a feature. I thought, however, the process would be quick and easy, and in a few months the sequel would come out and we’d have it ready by Halloween 2010. But that was not to be . . . largely because there were so many stories I did not yet know about, and so many people who wanted to make contributions. During the next two years, every time I spoke to Bill Bowman, the originator of the character, more stories came flowing out. But I digress. Anyway, in 2009, with the resolve to keep it to 90 minutes no matter what, and the promise of Mr. Lobo, host of VIRGINIA CREEPERS to reprise his role, we decided to produce our first ever sequel, HI THERE HORROR MOVIE FANS! Fortunately, Bill Bowman had a remarkable sense of comic timing and a great ability to go with the flow, improvising masterfully. So despite not having a script or even direction, The Bowman Body was an immediate smash. Then, like the movie cliché, they got hundreds of letters including one from the College of William & Mary with more than 400 signatures. 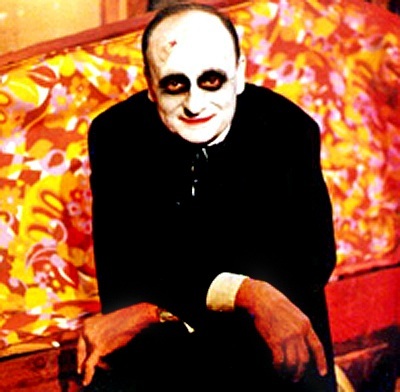 Bowman did a few more special weeks that year and then in February, 1971, he went on weekly on Friday nights with “Shock Theatre.” Before long, he was literally beating late night king, Johnny Carson, in the local ratings with his understated sense of humor and unpredictable antics. In the relatively conservative Richmond, VA market, the Bowman Body was a unique mixture of counterculture and good, clean irreverent humor. During that time, Bill Bowman was invited to act as Grand Marshal of parades all around the state and master of ceremonies at fraternity parties at more than half a dozen colleges. During those first years in the Richmond market, when the show was on WXEX out of nearby Petersburg, he made nearly weekly personal appearances where everybody from little kids to Hells Angels showed up. 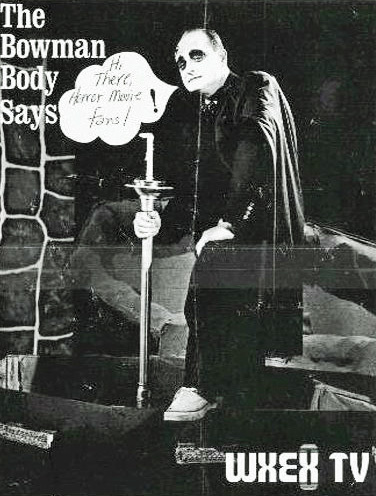 It was a wild and wooly time in TV in general in those days and in the course of doing the documentary, we recorded stories of naked college girls showing up at his home, medical skeletons used to frighten pedestrians, and an incident when Bowman’s promotional hearse accidentally led a funeral 20 miles or so off course. And that was just the tip of the iceberg. He was inserted in an unauthorized print of “Soul Train” that circulated the country, there was the famous “basketball incident,” and his show may have been responsible for the death of at least one guinea pig. 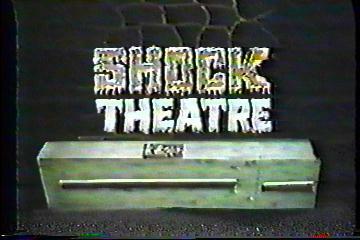 “Shock Theatre” lasted until September of 1976 when Bill departed the station, running on Friday and Saturday nights at different times. 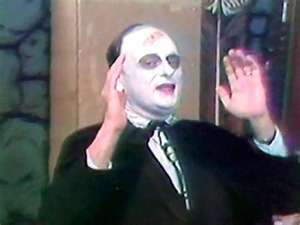 Within a year, he was invited to revamp the show on WVIR in Charlottesville where he picked up a side kick, Tom Blalock, who played “The Mummy,” for Cobweb Theatre. And when the show went off in 1979, he was briefly syndicated before recreating the show again as Monsterpiece Theatre with Countess Vampula in Fairfax, VA during the 1980s. We are very pleased to announce that HI THERE HORROR MOVIE FANS is currently nominated for a Rondo award and we hope horror host fans will check it out. If you want to know more about the film and the Bowman Body, please visit www.bowmanbody.com and we’d appreciate your vote at www.rondoaward.com if you are so inclined. This entry was posted in Horror Hosts and tagged HI THERE HORROR MOVIE FANS, SEAN KOTZ, The Bowman Body, Virginia Creepers. Bookmark the permalink. ← Horror Takes a Bow: An Interview with Wildclaw Theatre’s Scott Barsotti!